The worst floods in southeast Europe in 120 years claimed the lives of at least 80 people and caused billions of dollars in damages in Serbia and Bosnia-Herzegovina. In the aftermath of the worst flooding in the country in over a century, Serbian President Tomislav Nikolic invited India and Russia to join the international donor conference to help rebuild Serbia and Bosnia-Herzegovina, InSerbia News reported on Monday. Nikolic held separate meetings in Belgrade on Monday with the Russian Ambassador Alexander Chepurin and Indian Ambassador Narinder Chauhan, the website added. The Serbian president particularly thanked Russia for the significant support it provided to Serbia, the website said. Russia provided Serbia with humanitarian relief aid during the worst time of the flooding, flying in material and personnel in 4 IL-76 Emergencies Ministry aircrafts. The planes delivered power station equipment, water pumps, boats, blankets and also meat and fish cans, sugar, baby food and other necessities. A total of 70 tonnes of aid and 20 divers were sent from Russia to Serbia. The divers and search and rescue teams evacuated thousands of affected people. InSerbia news added that Indian Ambassador Chauhan expressed the deepest condolences for the great loss that Serbia has suffered. India paid $100,000 into a special bank account set up by the government of Serbia to help the flood victims, according to the website. The peak of the floods took place during the time of the Indian elections and very little coverage of the floods made its way to the Indian press. India enjoyed warm diplomatic ties with the erstwhile Yugoslavia from the days the two countries were among the founding members of the Non-Aligned Movement. The countries are also looking at upgrading ties to the level they were in the 1960s. Ambassador Chauhan confirmed that India intends to take part in the donor conference and asked Serbia to list the currently most needed items, according to the website. 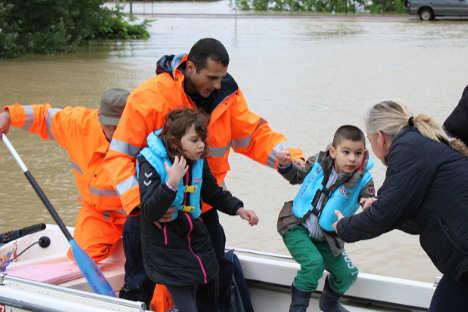 According to official counts, more than 1.6 million people were affected in Serbia and Bosnia-Herzegovina, after a week of flooding. Russia and India both suffered catastrophic floods in 2013. Russia’s Amur and Khabarovsk regions witnessed the flooding of the Amur River in the spring, while India’s Himalayan state of Uttarakhand suffered floods that stranded locals and pilgrims in many of Hinduism’s most sacred sites. Serbia and Russia have an emergency response centre in the Serbian city of Nis, while India has also explored cooperation with its close ally in natural disaster management.